The Star Shrine is an area accessed from the top of the past version of Star Hill, as seen in Mario & Luigi: Partners in Time. Mario, Luigi, Baby Mario, and Baby Luigi come here looking for Cobalt Star Shards (the last two to be exact). 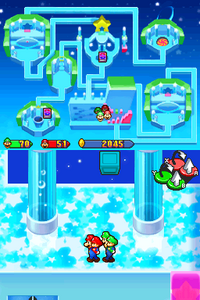 The place has many stars floating in space, and is similar to Star Hill. A living, star-shaped gate also resides here. Elder Shrooboid, the boss of this area, turns Toadbert and Kylie Koopa into Shroob Mushrooms here. Mario and company defeat Elder Shrooboid and get the last two Cobalt Star Shards here. Paper Mario's Star Haven is very similar to the Star Shrine in appearance, and is also reached by ascending Star Hill (or "Shooting Star Summit"). Ultra Mushroom (x2) In the ? Block in the northwest of the second room. 1-Up Super In the ? Block in the northeast of the fifth room. Ultra Drop (x2) In the right red block in the north of the fifth room. Red Pepper (x2) In the outer ? Block in the south of the fifth room. Refreshing Herb (x2) In the inner ? Block in the south of the fifth room. Copy Flower (x2) In the ? Block in the southeast of the second room. (x2) In the left ? Block in the north of the fifth room. Ice Flower (x2) In the northeast of the ? Block in the northwest of the fourth room. (x2) In the ? Block in the northwest of the fifth room. Pocket Chomp (x2) In the ? Block in the southeast of the fourth room. Hit-Free Badge In the left green block in the west of the wall in the fourth room. Shroom Badge A On the platform in the ? block on the left in the fourth scene. Bean In the northwest of the back area of the fourth room. This page was last edited on December 10, 2018, at 23:44.